The Talking Box: A Dramaturg on Television? I don't usually watch Law & Order, of any variety. But, when I heard that there was a dramaturg character on a recent episode of Law & Order: Criminal Intent, I set out to discover how they portrayed the character. Especially since I'm unaware of other instances of a dramaturg on a television episode - do you know of other cases? Although I write about television here, my roots are in writing in a theatrical capacity. Plus, I've been having a great time connecting with others and their ideas over the past four days at the annual Literary Managers and Dramaturgs of the Americas conference, which concluded this afternoon. Yeah, I know. the what??!? Well, I'm not going to give my own explanation of the profession today (though you can read a bit here), but I wanted to take a quick look at how the aforementioned episode portrayed the dramaturg. In a nutshell, an actor of a forever-in-previews show has a fatal accident onstage, and it's ultimately determined that the dramaturg (conspiring with the director) is the guilty party. - Roger Porter, the dramaturg for Icarus (a new work), is also referred to as "the director's assistant" throughout the episode. I'm not a huge fan of this terminology, as non-theatrical folks tend to merge that into "assistant director," which is not traditionally the same. - When he first met the investigators, Roger described his job as the following: "I help Amanda [the director] shape her creative vision in all aspects of the production." I'll take it. I like it, even. It was a pretty succinct way of talking about his role. But, at the same time, I was disappointed that there were no other mentions of his work on the episode. No real examples or talk of his interaction with anyone else besides the director. - Roger tweets about his work and/or the show's process. I particularly liked this as several conversations took place over the weekend about using Twitter (and other social media) from the dramaturgical standpoint, in rehearsal, etc. Also, the fact that the investigators have some concern over whether Roger's tweets might have enticed someone to harm Mark serves as a reminder that what we put out on the internet isn't private. - The investigators question Roger about the relationship between the lead actor and the director. He's also the one that lets them know that the lead actor was having an affair of sorts, and that he had two separate living quarters in NYC. And he talks about Amanda's drinking. In short, he's got all the gossip. I don't know that I feel that we (dramaturgs) are privy to the secret lives of the cast and crew, but we are observant. So, in a way, I liked that he had these bits of knowledge - it demonstrated that he pays attention and applies what he knows to situations as needed. 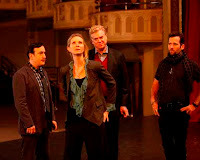 - Roger goes behind Amanda's back to make sure the lead actor makes it to the theater. This is the first instance we see of his sneaky and underhanded ways. As the fingers begin to point in Roger's direction, I'm just glad that he's not made out to be a villain all along. Dramaturgs are good people to work with, folks! - Just before he's arrested, Roger reveals to the investigators and the producer that, because he wanted to make sure he did everything right, he had recorded all of his conversations with the producer. I love this. I feel that it can be a meticulous process to make certain that dramaturgs are doing what is needed and desired by others working on the show. I have never personally recorded a conversation, but I take a crazy amount of notes! We start with an actor arriving to star in a Broadway preview of Icarus. He's a little late and almost doesn't get to go on, as the understudy is dressed to go. The director isn't thrilled with the actor, either. While he's flying there's an accident and he falls to the stage - broken neck from falling 30 feet. It's a crime scene, as it was determined to be sabotage. The rigging was secure at the safety check. [The wings alone took three months to complete!] We find out that the show has been plagued with safety issues. Roger Porter arrives, the dramaturg, or director's assistant as he described himself. "I help Amanda [the director] shape her creative vision in all aspects of the production." He's questioned about Amanda and Mark's [the dead actor] relationship. It's mentioned that rehearsals and previews were going on for two years! The investigators feel that perhaps Mark's tweets enticed someone. Meanwhile, turns out that the aerial rigger was paid to tamper with things several times to make them look like accidents, in order to get publicity. The producer wanted the first two problems, but didn't hire him to tamper with Mark's wings. The producer denied any wrongdoing. The understudy, Bryce, sent Mark flowers with peacock feathers, which are a bad luck omen. Bryce went to a favorite bar after he didn't get to go on, and the investigators talk to a cocktail waitress there. They then find out that a critic was at that preview and they talk to him about a possible cast change of Mark to Bryce, but the critic guesses that the director was overruled and Mark got to go on anyway. The composer wasn't aware that the critic was in the audience that night, and also mentions that the director constantly complained about Mark's performance. The composer also says that it was the producer who wouldn't let the cast change happen, as Mark had a huge fan base [he was formerly a sitcom star]. The composer also says that the director is on a downward spiral, and has nothing in life outside of her job. Plus, Amanda has been in AA for 20 years, but the composer noticed alcohol on her breath the night of the incident. She's also drunk at the memorial service. The dramaturg tells the investigators that Mark was sleeping with someone, and stayed in two different NY locations. Turns out, the composer was having an affair with Mark. Mark initially wanted to get the composer on his side against Amanda. The composer rode with Mark to the theater the night he was late - Amanda had made a deal with the chauffeur so that he'd make sure Mark was late. But, "the director's assistant" (which, in this case they mean dramaturg) called to ask the chauffeur to bring Mark to the theater after all. Amanda didn't know about this call. After all this, the producer is closing the show, and Amanda is packing up her office. Turns out, in the contracts for Icarus, there's a full pay-out for the investors if the lead actor dies or is incapacitated. The dramaturg is now the lead suspect, as he was worried about Amanda and her drinking. But the investigators deduce that the producer told the dramaturg to do it. The dramaturg recorded all the conversations because he wanted to make sure he did everything right. They're both arrested as the episode ends.